LOWBROWS PILOT POINT REOPENING FRIDAY NIGHT! Join me at Lowbrows in Pilot Point, Texas, tomorrow night, and introduce yourself to me – and a whole mind-bending experience as you find yourself transported back to the late 1800s at the saloon that is soon to be more famous than ever! I am a big fan of Lowbrows – whether with an “s” at the end or not, and it is my watering hole after a day of guiding on the most prolific and consistent carp flats in Texas. The bar is like a box of chocolates; you never know what you’re going to get. For sure, we won’t be seeing the previous proprietor, unless he haunts the place – which would be completely believable and proper. He was a bit of a timepiece himself. Regardless, it will be fun to see just how things go for the establishment just off the Historic Square in Downtown Pilot Point, Texas. I have high expectations. Now, what you will soon find is a bunch of rustlers who will make claims on “discovering” this rough diamond, but claims were staked many years ago, and we’ll defend that claim. I already know a few are bit-chompin’ to waste their .02-cents worth on Facebook posts, ne’er-do-wells and mind grabbers, who will yank out their camera, and hack away on Photoshop images of the Saloon. But they’re just the newcomers and profiteers … and they’ll soon NOT be photographers (much less “professional photographers”) anyway … and we’ll still be sitting at the bar after a day of poling the flats – as usual. WE FOUND THE NEW MAGNETIC NORTH, and we’re glad to share – just don’t steal the soul of it away. 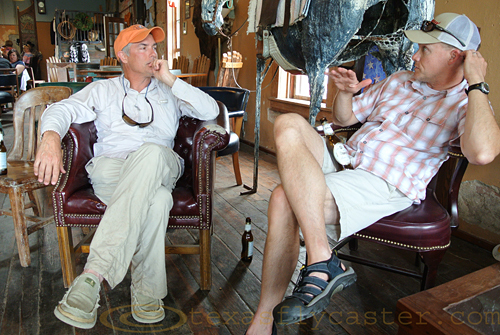 Talking carp with Joel Hays – in 2012 – at Lowbrows in Pilot Point, Texas.